Tushar Gandhi is the Great Grandson of Mahatma Gandhi, and in true Gandhian style, he has dedicated his life to spreading the message of non-violence and positive change. Nawang Khechog is a Grammy Nominee and most famous Tibetan Flautist in the World. His music is also used in this film “Road to peace” as well as for many documentary and also in the Hollywood film “Seven years in Tibet “. He was monk for 11 years and lived in the foothills of Himalaya as a hermit and meditated for 4 years, sponsored and guided by His Holiness the Dalai Lama. David Sanborn is renowned and revered through out the world as one of the greatest saxophone players of all-time. He has released 24 albums and won six Grammy Awards. He has had eight Gold albums and one Platinum album. Sometimes gifts come from unexpected places! When organizing the screening of “ROAD TO PEACE” at The Bamboo Buddha Cafe, Sydney, I had just two things in mind; to celebrate His Holiness’s 77th Birthday and to honour a pledge to raise funds for The Tengyur Translation Project. The expression of appreciation from the audience afterwards, was both overwhelming & completely disarming. There was such a beautiful energy in the room of warm heartedness and harmony catalysed by His Holiness and the ingenuity of the film makers art. This is the gift of “Road To Peace”, that it actually engenders the feeling of peace within those who behold it. Thank you Leon for your altruism and for allowing us to share in this profound experience. When the film ended, we in the audience went on asking questions, making comments, and relating allied experiences. There was an opening up to each other from different faith positions, in a community concern to be active in peace-making. 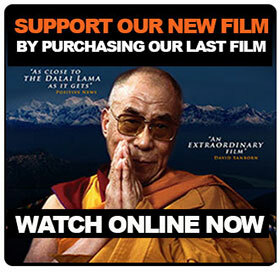 “The film Road to Peace which follows the UK visit (date) of the Dalai Lama is full of insights into a man with exceptional wisdom. It was fascinating to watch him travelling between British cities and drawing large crowds in order to impart his highly spiritual and pragmatic principles in a meaningful and humorous way. Sometimes just by using a few carefully chosen words the Dalai Lama is able to express his simple but profound message for humanity at this time in human spiritual evolution.